DULUTH — Chris Johnson had his hands full. Sitting alone in his fishing shelter Tuesday afternoon on Lake Superior, his fishing rod was bent in a serious arc. His rod tip was pointed straight at the bottom of Lake Superior 100 feet below. 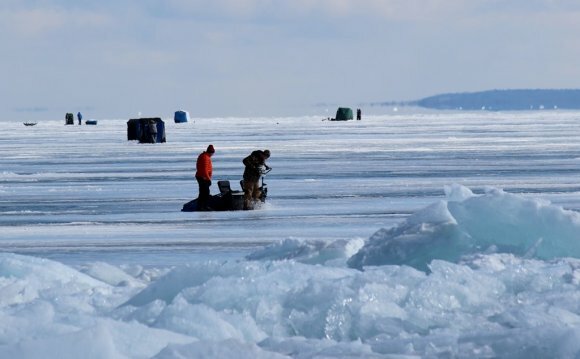 Johnson was the latest among hundreds of anglers who have ventured out on a foot or so of Lake Superior ice to jig for lake trout in recent days. 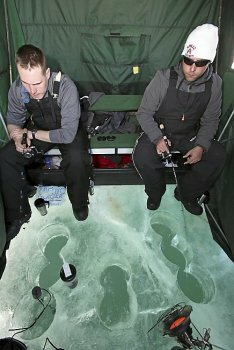 This is the first time in several years that anglers have found ice conditions they consider reasonably safe for foot travel. 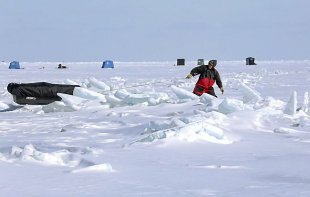 Johnson’s shelter was among 52 on the ice Tuesday afternoon off Brighton Beach. Most were from 300 yards to a quarter-mile from shore, atop 70 to 120 feet of water. As he played his lake trout, Johnson had another concern. He was using light monofilament line instead of the braided line many anglers use. He back-reeled quickly when the lake trout made its runs, then gained back line as the fish tired. Finally, after a 20-minute battle, Johnson could see the fish through his hole. “Oh, that’s a nice one, ” he said. He eased the nose of the big laker into the hole. “This is the dangerous part here, ” he said. A single hook from his Vibrato jigging spoon was impaled in the lake trout’s jaw. Johnson reached down, grabbed the fish by a gill cover and eased it out of the hole. It was a gorgeous Lake Superior specimen, silver-gray with characteristic creamy spots. It had to weigh close to 12 pounds. “That’s why you come out here and sit all day, ” Johnson said. His dad and two friends were fishing nearby. Johnson had picked one of them up at 4:15 a.m. to be on the ice of Lake Superior by 8:30 a.m.